Bone broth is a great source of easily digested protein, amino acids and trace minerals. Just one cup a day is reputed to play an important part in healing a leaky gut or in protecting a healthy one. In this recipe, a few simple ingredients are simmered together slowly over 24 hours to make a comforting, nutritious and delicious broth. 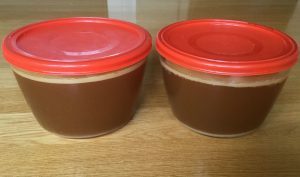 Whether you suffer from bowel problems or have an autoimmune condition or even if you’re just keen to avoid gut permeability, bone broth provides a nice way to protect gut health, since the amino acids it contains, such as glycine and proline, help seal tears and holes in the intestinal lining. A strong gut lining prevents food particles from leaking from the digestive system into the blood stream and is important if you want to avoid allergies, autoimmunity and general body inflammation. Apart from gut healing, other benefits of bone broth include plumper, more radiant skin, strong nails & shiny hair (from the collagen), joint health (from glucosamine & chondroitin sulfate) and improved immunity (from minerals). It’s all good! Whenever we have a roast chicken, I freeze the bone carcass and skin to use later in my bone broth. When I have 2 or 3 of them, I combine them with a tray of chicken legs and I’m ready to make broth. The best bones are the spine and the feet or the leg joints. Alternatively, if you have a friendly local butcher, you could ask them to save the bones left over when they fillet the chickens. Again, the spines will supply the most gelatin. It’s a good sign of quality if the broth gels when it cools. It means you’ve extracted the gelatin, with all its health-giving collagen, amino acids and minerals, from the bones. Place all ingredients in your slow cooker (crock pot). Add enough water to cover, stopping about 2 or 3 cm from the top of the pot. Simmer on the high setting for 24 hours. Allow to cool slightly and strain out the solids, using a colander or large sieve over a bowl or saucepan and pressing down the solids with a small plate to squeeze all the goodness out. Allow to cool further then pour through a sieve to remove smaller solids. Store in covered bowls or mason jars in the refrigerator. A thin layer of fat will rise to the top and this will help to preserve the stock underneath. Remove this layer of fat before taking out a cupful to heat. Use within a week or freeze for up to 3 months. Is Bone Broth Good for Everyone? The gelatinous parts of the chicken bones supply glutamate to the broth during long simmering. The more gellified the finished broth, the higher the glutamate content. Most people are fine with a long-simmered bone broth. The exception are people who are sensitive to glutamates. For those who are sensitive to it, glutamate is an excitotoxin which causes inflammation in the brain and nervous system. For some people, this could cause a migraine headache; for others it could give rise to hyperactivity or increased stimming. Anyone who is unable to tolerate artificial glutamates such as MSG may also have difficulty with naturally occurring glutamates such as matured cheeses, soy sauce, broccoli and walnuts. These people are likely to have the same intolerance to long-simmered bone broth. For them, a shorter cooked version will be better (3 hours). Although less nutrient dense, for anyone with a glutamate sensitivity, it will be more digestible while still being soothing to the gut lining. The recipe I use, above, is based one by Dr Axe. Dr Natasha Campbell-McBride makes it quite differently in Gut and Psychology Syndrome (GAPS). She puts a whole or half chicken into a large saucepan, covers with water, adds some salt and simmers for 11/2 to 2 hours. The chicken can be eaten and she recommends serving a cupful of the stock several times a day, between meals, to heal and seal the gut. Fussy Eater in Your House? If your child won’t drink a glass of bone broth, you can use this nutritious stock as the base for soups and in any preferred meat dish such as stews, curries and bolognese sauce.